The Delaware Botanic Gardens is Planning for Spring! It’s January. The days are lengthening minute by minute, but the ground is frozen, the nighttime temperatures are bitterly cold, and spring seems a distant hope. Still, the seeds have arrived at the hardware stores and garden centers, and just the sight of them inspires dreams of summer’s flowering gardens. At the Delaware Botanic Gardens on Pepper Creek, there has been no pause for winter. It is a giant leap of faith and a boatload of blood, sweat and tears to create a botanic garden from 37 acres of fallow farm fields and sloping woodlands. There are the things seen…the flowers, trees and pathways…and the things unseen…electrical service, irrigation and utilities. All in need of donations to make them happen. In December, the DBG was awarded a generous multi-year grant from the Ellice & Rosa McDonald Foundation toward the creation of the Entry Garden which includes the drive in from Piney Neck Road, the parking area, and the Rhyne Garden which will capture and filter run-off water from the adjacent building and paved surfaces. 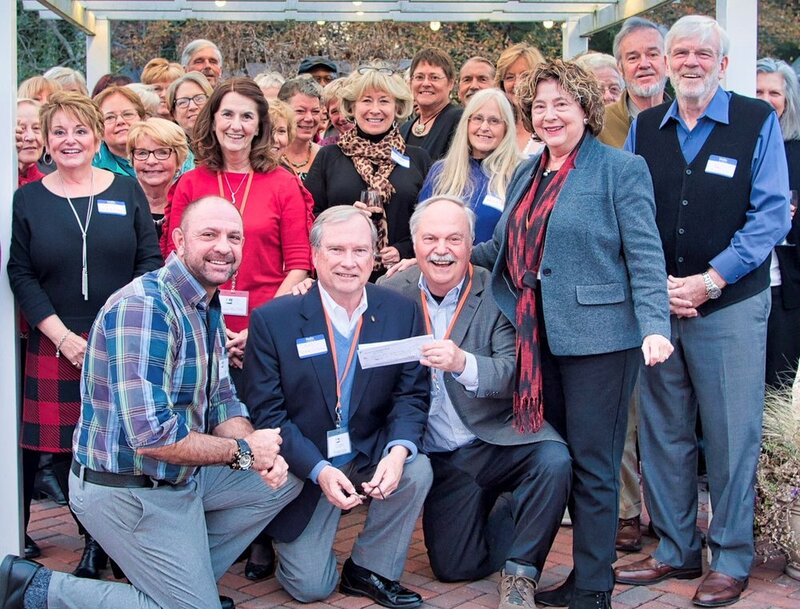 Many of our volunteers at the 2017 Delaware Botanic Gardens Volunteer Appreciation dinner stand behind Gregg Tepper, Cam Yorkston, Ray Sander and Sheryl Swed who are displaying the grant check from the Ellice & Rosa McDonald Foundation. Ray Sander, DBG President of the Board expressed thanks to the 137 friends and members who made donations to the Gardens between ‘Giving Tuesday’ in November and the year end, totaling nearly $30 thousand, but said “there is still a steep hill to climb and many new friends to be made. As we begin 2018, we have raised over $2 million for this visionary project and 95% of these funds have been spent here in Delaware with local firms and businesses, which in turn helped create and sustain jobs in our region. $1.5 million is still needed to complete the work in Phase One to ‘Open the Garden Gates.’” He noted that for those who would like to make a legacy gift, there are opportunities for individuals to name a garden in memory or in honor of a loved one or family. In September, the DBG will hold it’s annual ‘farm dinner’ in the Gardens for the first time—it will be a chance for the public to get a first look at the Delaware Botanic Gardens and see the Meadow Garden, designed by internationally renowned Dutch garden designer Piet Oudolf, in bloom for the first time. Tickets will go on sale this summer. The mission of the Gardens is to create an inspirational, educational, and sustainable public garden in Delaware for the benefit and enjoyment of all. The Delaware Botanic Gardens will celebrate the coastal plain with a sustainable garden that delights and educates visitors and inspires them to preserve Delmarva’s native landscapes. Further information on the Delaware Botanic Gardens, including membership and donations, go to delawaregardens.org and facebook.com/delawaregardens. Press release as seen in the Cape Gazette.